It has been a busy couple of months, hence no posts on THE RACE. In my last one, I hope I made it clear that scientists have senses of humor (my favorite ones do, anyway). Here’s another fact you might not know; regardless of what he or she studies, there is probably not a single field biologist anywhere who does not have a secret dislike or even fear of one sort of critter or another. 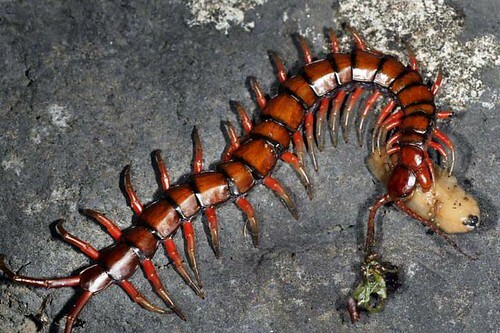 With me, it has always been centipedes– even when I was a child. I can’t bear the things! And, naturally, there are some real monsters common on São Tomé. 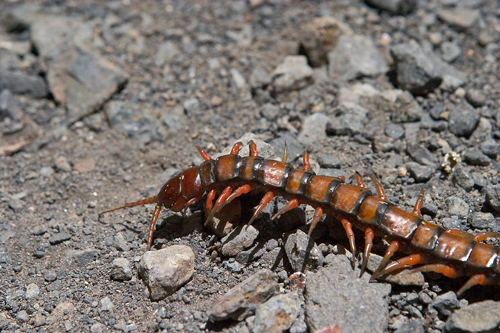 The creatures in the shots below are about 10 inches long, sometimes they get larger! These arthropods are more properly known as scolopendras, and they are voracious predators; the upper one is devouring a slug. 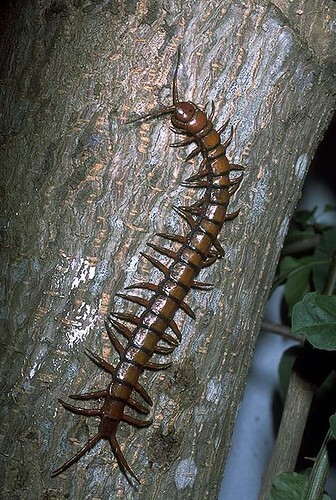 The two above are Scolopendra subspinipes, are native to Southeast Asia and thought to have been brought to the islands accidentally. The Academy was just visited by Dr. Rowland Shelley, a specialist on millipedes from the North Carolina State Museum, who had a look at some of our critters. 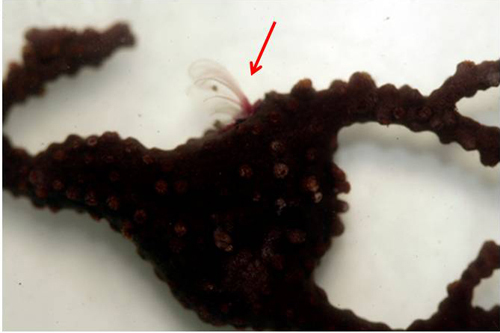 He and his colleague, Dr. John Lewis of the UK identified these but, more exciting, the one pictured below. 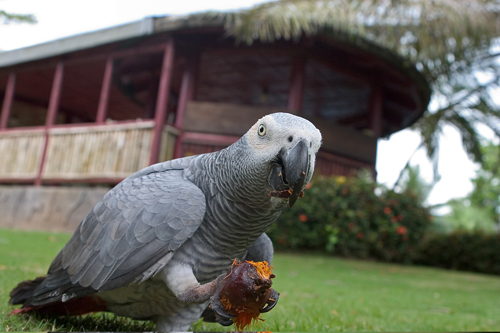 This is a different species that was originally described from São Tomé over 120 years ago. It is thought to also occur in West Africa; if this is the case, O. productus is not an endemic species but it is probably naturally occurring. 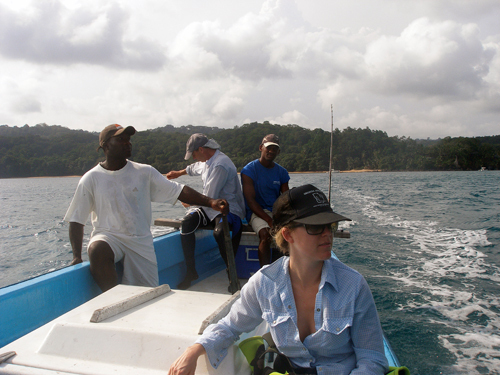 Ricka Stoelting (above at right), my grad student and GG I participant, is putting the finishing touches on her manuscript on the fabulous São Tomé, “cobra bobo.” After submitting it for publication, she will pursue her PhD at the University of Wisconsin. 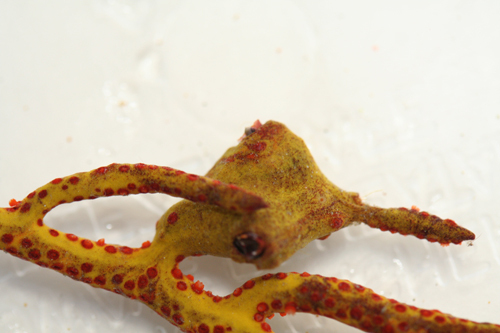 Ricka’s research has shown that this remarkable legless amphibian, Schistometopum thomense is indeed a true endemic species, having gotten to the island by natural means. 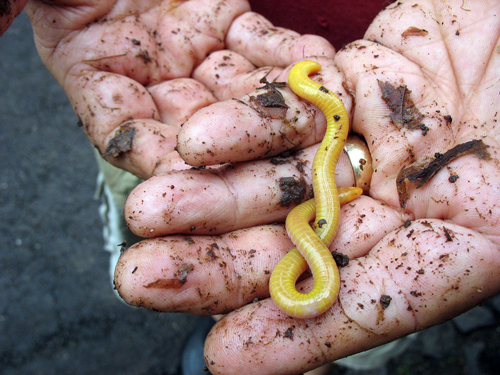 By studying the genetics of these bright yellow burrowers, she has learned that there are two different genetic groupings of the caecilian on the island and this is possibly related to volcanic activity within the last million years. 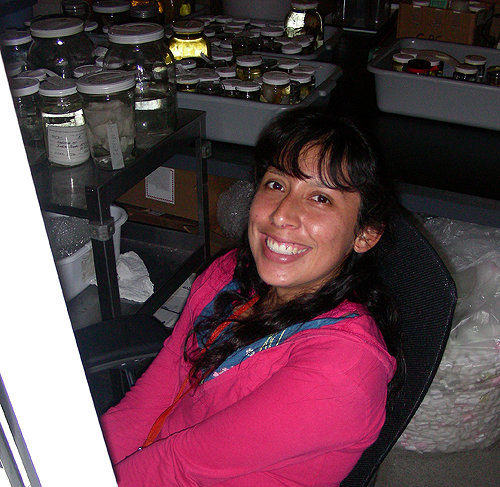 Our snake project on “cobra jita” (Lamprophis – see earlier blogs) is ongoing; my intern, Lisette Arellano (below) has returned from the University of California, Santa Barbara and is working down in our molecular lab as I write. Last summer we learned that although they are very similar in appearance, the snakes on São Tomé and Príncipe are genetically distinct from one another based on Lisette’s analysis of the cytochrome b gene. We think that analysis of an additional nuclear gene will be useful. The big issue lies with the status of jita’s relatives on the mainland. 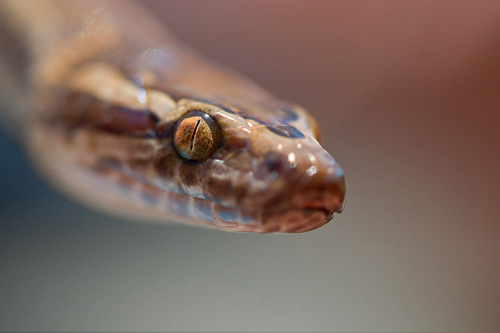 While we are now reasonably sure that the two island populations are separate species, we do not know what their relationships are to the at least 12 species of Lamprophis distributed widely in Africa; it is possible that either or both of our island snakes could belong to one these mainland species. Unfortunately the relationships (systematics) of this whole group in Africa are poorly understood. Dr. Chris Kelly of Rhodes University who is working on the entire complex has kindly sent us a number of tissue samples of Lamprophis from some West African localities, and these are what Lisette is analyzing now. In June, Lisette is off to the University of Colorado to pursue her PhD. Hopefully, we will have figured out our island snakes by then. More anon and before our return to the islands.